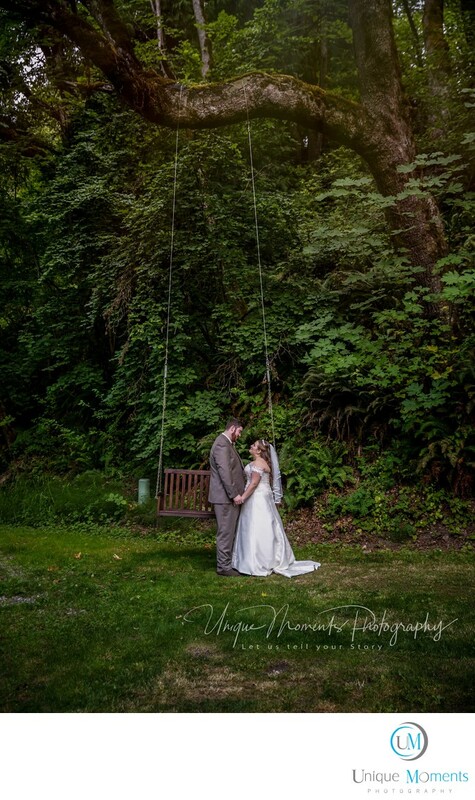 Unique Moments Photography traveled to the Sanders Estate in Auburn Washington to capture this awesome wedding for Miranda and Adam. This was a Friday wedding and our couple only had the estate rented from 3-9:30PM. So we had to work fast but we managed to capture some great images at this wedding that had a larger bridal party and extended families. As with all of our weddings, we want to be able to tell a story with the images we capture and we want the bridal party and families to have fun while we do this. This absolutly happened with this wedding and we were honored to be a part of this one. The Sanders estate is beautiful and it is set up to capture outstanding imagery for families that want an outdoor style wedding. The getting ready areas are beautiful as well as the grounds for capturing pictures. It is one of those “Cant Miss” venues for experienced photographers who can capture great images under any lighting condition. This wedding had it all and it was captured in 6.5 Hrs. This was our base package. The images captured tell a great story so we are hoping the families will create an album for the couple and put it all together in a keepsake album. Its one of the great wedding stories that we have captured for 2018 season and we are very proud of the results.